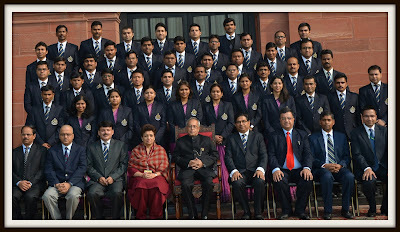 87 probationers of the 64th batch of the Indian Revenue Service (Customs and Central Excise) from the National Academy of Customs, Excise and Narcotics, Faridabad. The interaction took place at Rashtrapati Bhavan. Mukherjee also stated that in his various stints in the ministry of finance and other ministries, he had a chance to look closely at the growth in revenue services, according to a statement issued by Rashtrapati Bhavan. The President had a piece of advice for the young would-be-officers. He said the job of tax collection is “complicated and not easy”. He advised the probationary officers to discharge their responsibilities with sincerity and by creating a conducive atmosphere, the statement said. Among 87 probationers from 18 states, 15 are women officers and three are from the Royal Kingdom of Bhutan. Those who know Mukherjee well say he enjoys interacting with revenue officials. In April this year, Mukherjee advised future taxmen belonging to Indian Revenue Service (Income-Tax) at Nagpur’s National Academy of Direct Taxes to apply a test whenever they are “in doubt”, or when the “self becomes too much” with oneself. “Whenever you are in doubt, or when the self becomes too much with you, apply the following test. Recall the face of the poorest and the weakest man [woman] whom you may have seen, and ask yourself, if the step you contemplate is going to be of any use to him [her]. Will he [she] gain anything by it? Will it restore him [her] to a control over his [her] own life and destiny? In other words, will it lead to swaraj [freedom] for the hungry and spiritually starving millions? Then you will find your doubts and yourself melt away.” Mukherjee quoted that from Mahatma Gandhi’s Talisman.